Carlos Rodriguez Rios ’18, joined the PCAA Bear Scholarship Program in Fall of 2015. 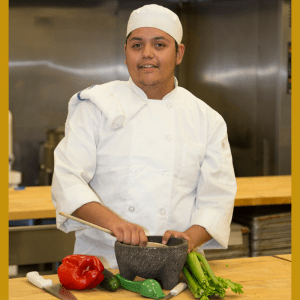 He graduated from Phoenix College with an associate degree in business communications and culinary studies. He hopes one day to own his own restaurant. Carlos is attending ASU to obtain a bachelor’s degree in communication. While at Phoenix College, Rodriguez chose electives that would complement his degree, including sign language courses. His goal is to have a tri-lingual language focus (i.e. Spanish/English/American Sign Language) to compliment his Bachelor of Arts in Communication degree. To Carlos, communication is a natural fit with the culinary world. “Chefs communicate their art on a plate. They see how people react. My art stems from my Hispanic-American roots – I will hone that. It’s a labor of love – passion,” he says.